I'm a granola fiend; if there's granola in the house I guarantee it won't be there long! I love the oaty goodness as cereal with almond milk and berries, topped with coconut yogurt, sprinkled on smoothie bowls are just to nibble on as a snack during the day. It's safe to say I'm a granola addict. 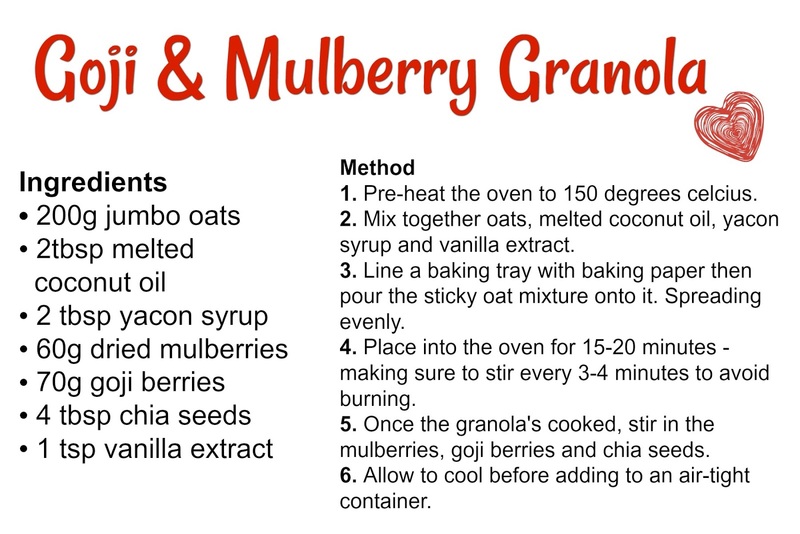 My newest granola recipe obsession is this Goji & Mulberry Granola I've made in collaboration with Of The Earth Superoods. 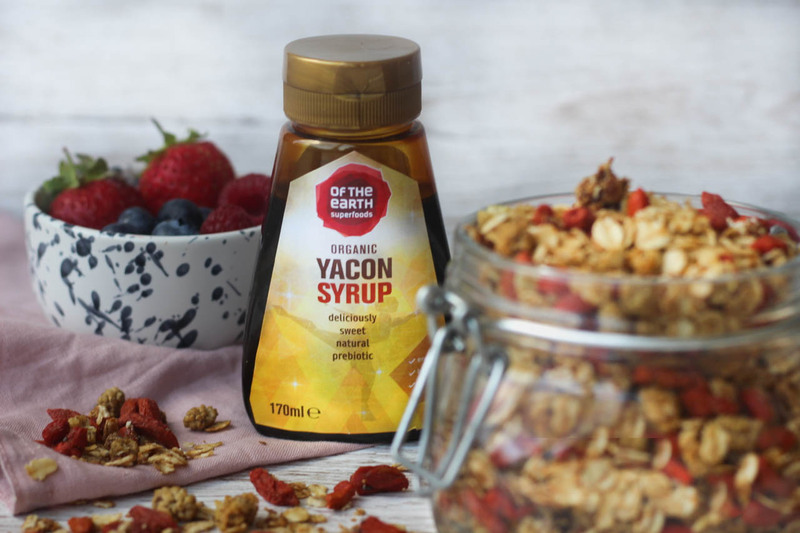 It's just the perfect summer granola recipe with the two delicious super-berries, naturally sweetened with Yacon Syrup and a few chia seeds thrown in there for some added healthy fats and fibre. 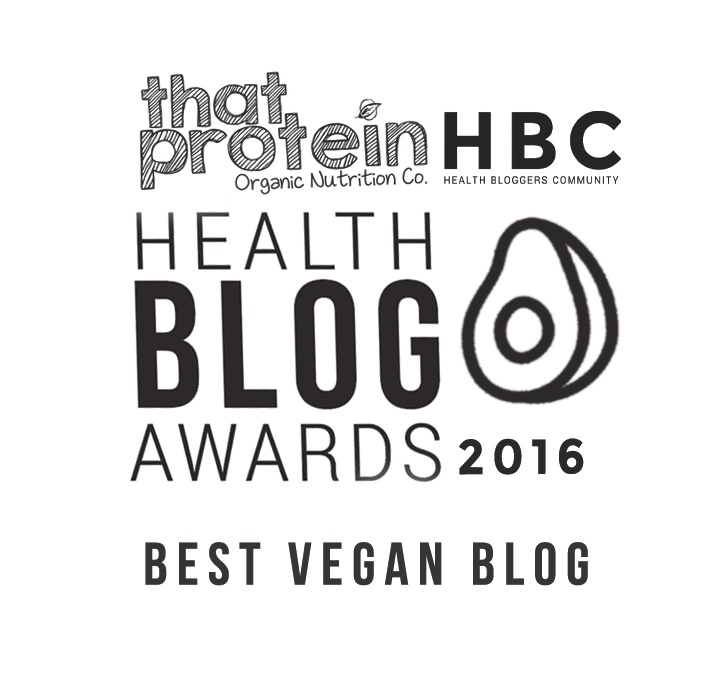 I used goji berries, mulberries, chia seeds (all under £5!) and yacon syrup all from Of The Earth Superfoods for this recipe which are all totally organic. 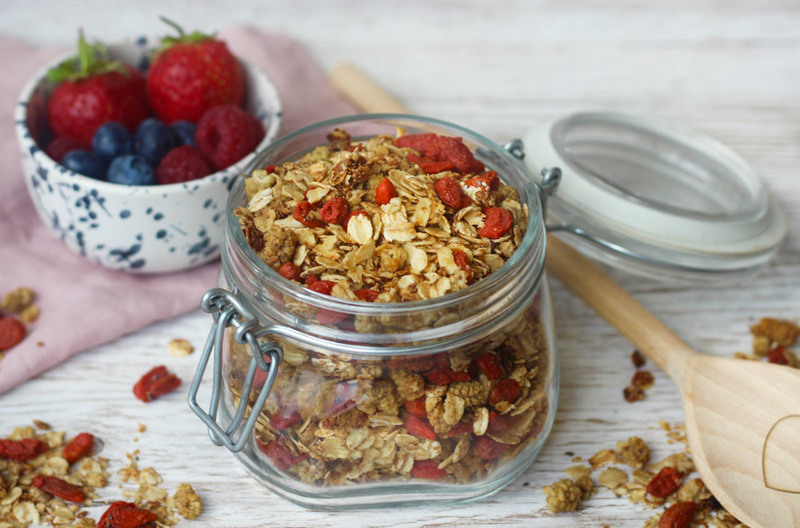 The granola base is made using traditional oats, you just can't beat that oaty texture. 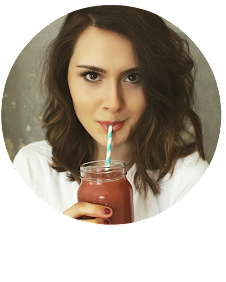 But I mixed it up by adding superfood berries from Of The Earth Superfoods for a difference in flavour and some amazing anti-oxident power - did you know goji berries are super high in vitamin C, and mulberries are high in iron? For a natural sweetener I used Yacon Syrup which I actually had never tried before but it's my new favourite thing. It's derived from a Peruvian root vegetable (has to healthy then, right? ), and it's also a natural pre-biotic (meaning it's great for that gut health!). Plus, it aids calcium absorption and has a low G.I so it's suitable for those with diabetes! It has a rich taste that's simpler to date nectar or dark maple syrup - so yum. My favourite way to eat this granola is with coconut yogurt, and an extra drizzle of yacon syrup!